Release price guide: Hush Now | Flashing on label London Records with catalogue numnber FLX 3197, The Netherlands. Jimi Hendrix Record Value Release price guide: Hush Now | Flashing on label London Records with catalogue numnber FLX 3197, The Netherlands. 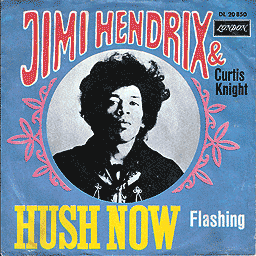 Hush Now | Flashing is the collectable edition of title Hush now recorded by Curtis Knight & Jimi Hendrix. The record was published with catalogue number London Records FLX 3197. This pressing was released in The Netherlands. This record was release on 00000000. It was released as a single (7") and appeared on the London Records record label. Our auction results for FLX 3197 were last updated on 2019-04-13. Out of 4 auctions 3 items were sold. The best auction result was $174.85 On average $68.28 was the price paid for this record. Great white sixties sleeve with stunning picture of Jimi in balck & white.